When Africa breaks free from the grip of poverty and famineas it now looks poised to doMonty Jones, 56, will have played a pivotal role. A native of Sierra Leone, Jones is the revered plant breeder who developed NERICA, the New Rices for Africa, a set of high-productivity rices adapted to West Africa's growing conditions. Jones' efforts in creating NERICA are legendary. He and his team painstakingly crossed varieties of Asian and African rices to find stable and fertile breeds that would combine the yields of Asia's plants and the toughness of Africa's. NERICA is now being taken up by farmers across West Africa, boosting food security and incomes. 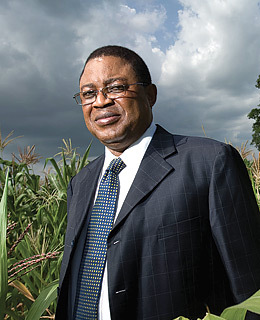 Jones' work has also helped inspire other groups to support an African Green Revolution. The payoff will be a healthy, well-nourished continent on a path to economic development.